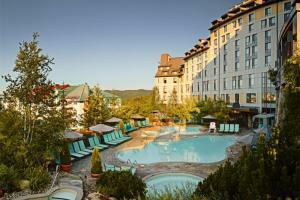 Experience the ultimate in comfort and treat yourself to the perfect location when staying in Mont-Tremblant, Quebec. Nestled in the heart of a scenic village at the foot of the mountain, Fairmont Tremblant is the only ski-in/ski-out resort of the region, offering easy access to ski tracks or hiking trails. All of the 314 spacious guest rooms come appointed with high-end amenities and many of them offer stunning views over the majestic Mont-Tremblant or Tremblant Lake. Located about 50 minutes away from Mont Tremblant International Airport. Windigo Restaurant, Wigwam Cafe, Kiona Terrace, Nansen Lounge. Skiing, Mountain Climbing, Biking, Casino de Mont-Tremblant, Mont Tremblant Activity Centre, Via Ferrata du Diable.